Hanumana was a famous mythical monkey chief in the timeless Sanskrit epic Ramayana. From a seated positions with the legs diagonally out lean toward one hip to allow ease when positioning the other back and align the other. The front leg has a tendency to externally rotate. Glance at the knee or toes in this posture and correct the alignment after settling into this pose. It can be quite challenging to turn the chest forward. Engage the spinal rotators and core muscles but be careful not to suppress breathing. Roll the back leg inward a little it has a tendency to turn out. Place your hands beside your hips and lower yourself down gently. It takes a moment for the muscles to release and sometimes after a hard practice there is swelling and an inflammation present.This makes it a little harder to enter and even more time must be given for the muscles to relax. If the body is properly warmed up the muscles will relax quicker. T his posture can be done with props and supports if the leg muscles are not flexible but it is probably better to spend time in effective hamstring stretches until the muscles are flexible enough to comfortably enter this posture. Spending all day getting into one posture sacrifices other postures that are necessary for progression. Work on the most effective ways to gain flexibility and introduce advanced postures like this when the time is right. This is one of the major hamstring stretches in yoga. It also stretches hip flexors and lower back muscles. This is a yoga posture that requires very flexible hamstrings. Offer the variation Parsva Upavistha Konasana which is just the seated splits where you lean towards one leg. 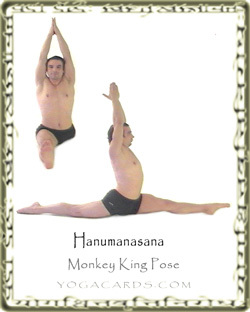 Then offer Hanumanasana for advanced practitioners.